Order YOUR diary now from Motorheads or Autobooks. The ultimate diary for the motoring enthusiast... Motorheads 2019, annual edition # 13 is now available. Back in 2005, Heide-Marie von der Au was smitten by the sudden realisation that many of her large circle of petrol-head friends had all sorts of fascinating hobbies and pastimes beyond the usual cars, bikes and motorsport. These included aviation, vintage tractors and stationary engines, steam trains, motor scooters, and all the memorabilia associated with their various passions. How on earth did people with such wide ranging interests harvest and store information on all the events happening throughout Southern Africa? Did they scribble things down on pieces of paper that were continually getting lost or thrown away? Or did they spirit the info away in the darkest recesses of their computer hard drives and then lose track of them? Was there some sort of an easily accessible diary available, she wondered? The answer was a resounding NO, and Motorheads was born. Motorheads Diary 2019 is a concise annual overview of, let's call them mechanical or mechanized happenings in South Africa, showcasing the full spectrum of motoring and other related events to provide the enthusiast with all the relevant information. When you're not reading you can start writing, because it's also a very useful page-per-day business diary that relies upon the most reliable and indispensable input device known to man & the pen, or pencil. It's bright and cheerful and stands out amidst the more boring stuff on your desk, making it easy to access. About the worst thing that can happen is that it becomes waterlogged when your house washes away or turns into ashes along with everything else in the office fire. Or snatched with your bag or briefcase... At least you have some control over that! It titivates with historical motoring-related facts, as well as a calendar of races, rallies, car-boot sales shows & biking events. Significant international happenings like motorcycle and Formula One Grand Prix are also included. Profiles and short articles by well-known historians and journalists cover a cross-section of interesting people, events, machines and clubs provide additional interest. 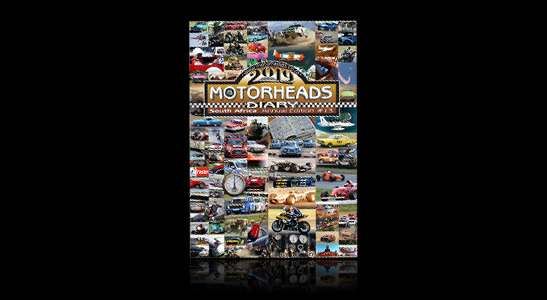 Motorheads 2019 diary is a must-have for the motoring enthusiast! And now you can also tune in to Radio Motorheads, on the first Monday of each month, on 93.8 MIX fm, 8-9 pm.